First Performance: June 2003, Wilton’s Music Hall, Patrizia Meier. Dolorato grew out of a piece commissioned by the Spitalfields Festival celebrating the silk-weaving of the Huguenot immigrants who settled in London in the seventeenth century. 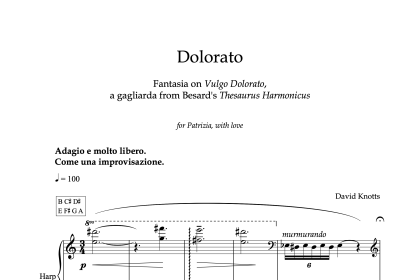 I was keen to find some music which this refugee population might have been familiar with and came across a beautiful galliard in Besard’s European collection, Thesaurus Harmonicus, with the enigmatic title, Vulgo Dolorato which translates as common sorrow. This fantasia takes the form of a series of variations. 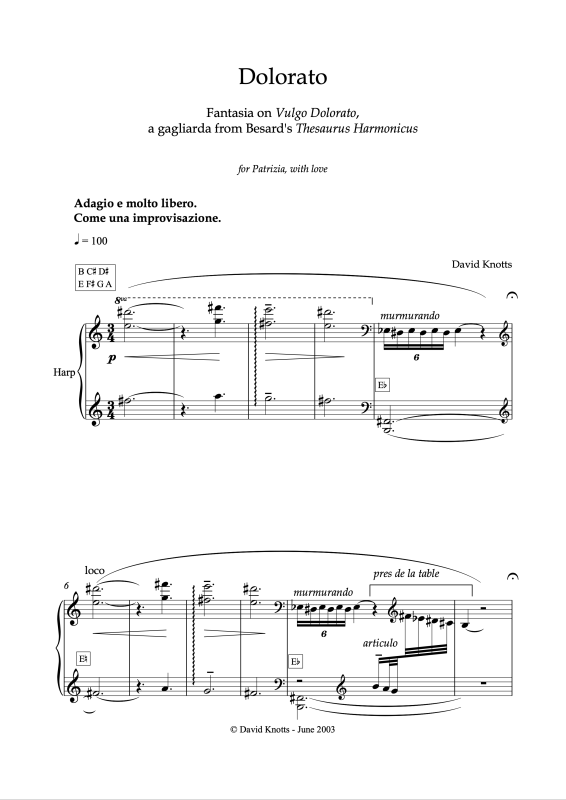 The original galliard is alluded to in the harmony of the opening music and progressively comes into focus as the piece progresses, peeling away layer by layer until Vulgo Dolorato is heard.